SA to downgrade diplomatic relations with Israel - SABC News - Breaking news, special reports, world, business, sport coverage of all South African current events. Africa's news leader. The South African Zionist Federation says South Africa is excluding itself from a mediation role she needs to play in bringing about peace in the Gaza region by acting in haste in taking sides. Thousands of people in Cape Town participated in a protest march on Parliament in solidarity with the Palestinian people’s Great Return March. Various faith based organisations and NGO’s joined the Muslim Judicial Council in calling for the expulsion of the Israeli Ambassador from South Africa in response to what it calls the continued oppression of the Palestinian people. They came in their numbers hoisting Palestinian flags and donning its colours. All in a show of support. Speakers commended the South African government for recalling its ambassador to Israel. Among those calling for international solidarity with the Palestinian people was the ANC’s Deputy Secretary General, Jesse Duarte. ANC Member of Parliament Chief Mandla Mandela accepted the memorandum of grievances on behalf of Parliament. He has commended the South African government for withdrawal of its Ambassador to Israel, Sisa Ngombane with immediate effect until further notice. Mandela has also called for the Israeli Embassy in South Africa to be closed. 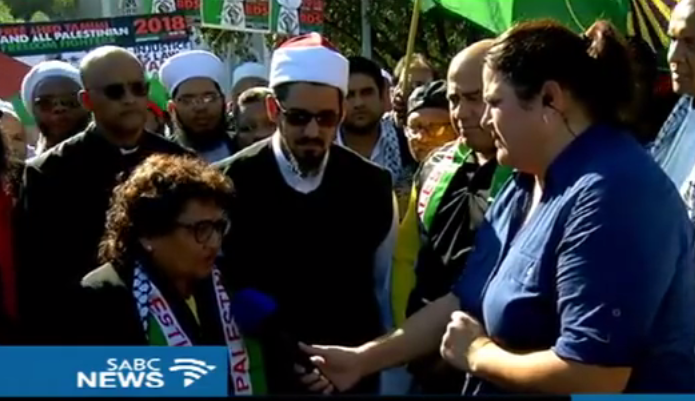 Spokesperson for the South African Zionist Federation, Rowan Polovin says the South African government is short sighted as it is removing itself from playing a mediating role. This entry was posted on 15 May 2018,08:26PM at 8:26 PM and is filed under South Africa, News. You can follow any responses to this entry through the RSS 2.0 feed. Both comments and pings are currently closed.